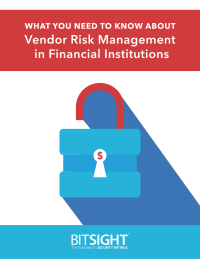 As banks and financial services place more focus on vendor risk management (VRM), continuous monitoring solutions will become more commonplace. And with the due diligence required by regulators and lawmakers, other industries will likely follow suit, seeking ways to conduct more effective and repeatable vendor risk assessments. The industry adoption of SOC 2 and continuous monitoring services like BitSight Security Ratings will help pave the foundation of confidence that financial institutions and their business partners are looking for. In fact, continuous risk monitoring is one of the most practical and efficient methods your financial services organization can use to prepare for the changing threat landscape. Organizations that adopt these cybersecurity best practices can improve security awareness across their organization and gain increased visibility into vendor threats.